Data protection | DICO e.V. Thank you for your interest in our company. Data protection is of particular importance to the management of the Deutsches Institut für Compliance e.V.. Use of the Internet pages of the Deutsches Institut für Compliance e.V. is generally possible without the disclosure of any personal data. However, if a data subject wishes to make use of special services of our company via our website, it may be necessary to process personal data. If the processing of personal data is necessary and there is no legal basis for such processing, we generally obtain the consent of the data subject. The processing of personal data, such as the name, address, e-mail address or telephone number of a person concerned, is always carried out in accordance with the Basic Data Protection Ordinance and in accordance with the country-specific data protection regulations applicable to the Deutsches Institut für Compliance e.V. (German Institute for Compliance). By means of this data protection declaration, our company would like to inform the public about the type, scope and purpose of the personal data collected, used and processed by us. Furthermore, data subjects will be informed of their rights by means of this data protection declaration. The Deutsches Institut für Compliance e.V., as the person responsible for processing, has implemented numerous technical and organisational measures to ensure that the personal data processed via this website is protected as completely as possible. Nevertheless, Internet-based data transmissions can have security gaps, so that absolute protection cannot be guaranteed. For this reason, every person concerned is free to transmit personal data to us by alternative means, for example by telephone. The data protection declaration of the Deutsches Institut für Compliance e.V. is based on the terms used by the European Directive and Ordinance Giver when the Basic Data Protection Ordinance (DS-GVO) was issued. Our data protection declaration should be easy to read and understand both for the public and for our customers and business partners. To ensure this, we would like to explain the terms used in advance. Personal data are all information relating to an identified or identifiable natural person (hereinafter „data subject“). Identifiable is a natural person who can be identified directly or indirectly, in particular by assignment to an identifier such as a name, an identification number, location data, an online identifier or one or more special characteristics that express the physical, physiological, genetic, psychological, economic, cultural or social identity of that natural person. German Institute for Compliance e.V. The website of the Deutsches Institut für Compliance e.V. collects a series of general data and information each time a person or an automated system accesses the website. This general data and information is stored in the log files of the server. We may record (1) the browser types and versions used, (2) the operating system used by the accessing system, (3) the website from which an accessing system reaches our website (so-called referrer), (4) the subwebsites which are accessed via an accessing system on our website, (5) the date and time of access to the Website, (6) an Internet Protocol address (IP address), (7) the Internet service providers of the accessing system, and (8) other similar data and information used for security purposes in the event of attacks on our information technology systems. When using this general data and information, the Deutsches Institut für Compliance e.V. does not draw any conclusions about the person concerned. 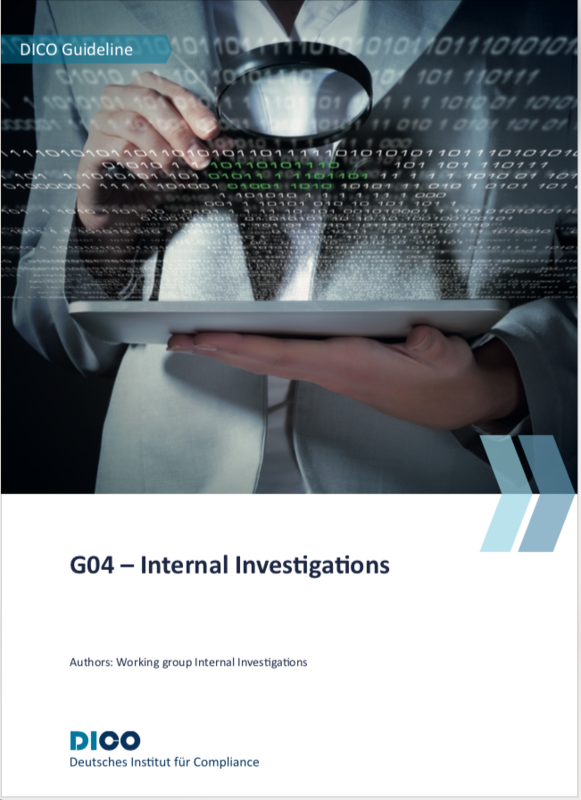 Rather, this information is required to (1) correctly deliver the contents of our website, (2) optimize the contents of our website and the advertising for it, (3) ensure the permanent functionality of our information technology systems and the technology of our website, and (4) provide law enforcement authorities with the information necessary for criminal prosecution in the event of a cyber attack. These anonymously collected data and information are therefore evaluated by the Deutsches Institut für Compliance e.V. on the one hand statistically and on the other hand with the aim of increasing data protection and data security in our company in order to ultimately achieve an optimal level of protection for the data processed by us. You can revoke your consent to the storage of the data, the e-mail address and its use for sending the newsletter at any time. The revocation can take place via a link in the newsletters themselves or by notification to the above contact possibilities. The newsletter is sent via „MailChimp“, a newsletter distribution platform of the US provider Rocket Science Group, LLC, 675 Ponce De Leon Ave NE #5000, Atlanta, GA 30308, USA. The e-mail addresses of our newsletter recipients, as well as their further data described in the context of these notes, are stored on the servers of MailChimp in the USA. MailChimp uses this information to send and evaluate the newsletter on our behalf. Furthermore, MailChimp can use this data according to its own information to optimize or improve its own services, e.g. to technically optimize the sending and presentation of the newsletter or for economic purposes, in order to determine from which countries the recipients come. However, MailChimp does not use the data of our newsletter recipients to write them down itself or passes the data on to third parties. We trust in the reliability and IT and data security of MailChimp. MailChimp is certified under the US-EU data protection agreement „Privacy Shield“ and thus commits itself to comply with EU data protection regulations. Furthermore, we have concluded a data processing agreement with MailChimp. This is a contract in which MailChimp undertakes to protect the data of our users, to process them on our behalf in accordance with their data protection regulations and in particular not to pass them on to third parties. The data protection regulations of MailChimp can be viewed here. You can cancel the receipt of our newsletter at any time, i.e. revoke your consent. At the same time your consents to its dispatch via MailChimp and the statistical analyses expire. A separate cancellation of the dispatch via MailChimp or the statistical evaluation is unfortunately not possible. You will find a link to cancel the newsletter at the end of each newsletter. The newsletters contain a so-called „web-beacon“, i.e. a pixel-sized file that is retrieved from the MailChimp server when the newsletter is opened. Within the scope of this retrieval, technical information, such as information about the browser and your system, as well as your IP address and time of retrieval are initially collected. This information is used to technically improve the services based on the technical data or the target groups and their reading behaviour based on their retrieval locations (which can be determined using the IP address) or access times. Due to legal regulations, the website of the Deutsches Institut für Compliance e.V. contains information that enables rapid electronic contact with our company and direct communication with us, which also includes a general address for so-called electronic mail (e-mail address). If a data subject contacts the data controller via e-mail or a contact form, the personal data transmitted by the data subject will be stored automatically. Such personal data voluntarily provided by a data subject to the controller will be stored for the purpose of processing or contacting the data subject. This personal data is not passed on to third parties. The Deutsches Institut für Compliance e.V. offers users the opportunity to leave individual comments on individual blog posts on a blog located on the website of the person responsible for the processing. A blog is a portal on a website, usually open to the public, in which one or more people who are called bloggers or web bloggers can post articles or write down thoughts in so-called blog posts. The blog posts can usually be commented by third parties. If a person leaves a comment in the blog published on this website, not only the comments left by the person concerned but also details of the time of entering the comment and the user name (pseudonym) chosen by the person concerned are stored and published. Furthermore, the IP address assigned to the person concerned by the Internet service provider (ISP) is logged. This IP address is stored for security reasons and in the event that the person concerned violates the rights of third parties or posts illegal content by submitting a comment. The storage of this personal data is therefore in the personal interest of the data controller, so that he or she can exculpate himself or herself in the event of a violation of the law. The personal data collected will not be disclosed to third parties, unless such disclosure is required by law or serves the legal defence of the data controller. The comments posted on the blog of the Deutsches Institut für Compliance e.V. can be subscribed to by third parties. In particular, it is possible for a commentator to subscribe to the comments that follow his comment on a particular blog post. If one of the above-mentioned reasons applies and a data subject wishes to have personal data stored at Deutsches Institut für Compliance e.V. deleted, he or she may contact our data protection officer or another employee of the data controller at any time. The data protection officer of the Deutsches Institut für Compliance e.V. or another employee will arrange for the request for deletion to be complied with immediately. If the personal data was made public by the Deutsches Institut für Compliance e.V. and if our company, as the person responsible, is obliged to delete the personal data in accordance with Art. 17 Para. 1 DS-GVO, the Deutsches Institut für Compliance e.V. will take the following action to inform other data processors processing the published personal data, taking into account available technology and implementation costs, that the data subject has requested the deletion of all links to such personal data or of copies or replications of such personal data from those other data processors, where processing is not necessary. The data protection officer of the Deutsches Institut für Compliance e.V. or another employee will take the necessary steps in individual cases. If one of the above conditions is met and a data subject wishes to request the restriction of personal data stored by the Deutsches Institut für Compliance e.V., he can contact our data protection officer or another employee of the data controller at any time. The data protection officer of the Deutsches Institut für Compliance e.V. or another employee will arrange for the processing to be restricted. To assert the right to data transferability, the person concerned can contact the data protection officer appointed by the Deutsches Institut für Compliance e.V. or another employee at any time. The Deutsches Institut für Compliance e.V. will no longer process personal data in the event of an objection, unless we can prove compelling reasons worthy of protection for the processing, which outweigh the interests, rights and freedoms of the person concerned, or the processing serves to assert, exercise or defend legal claims. If the Deutsches Institut für Compliance e.V. processes personal data in order to conduct direct advertising, the person concerned has the right to object at any time to the processing of personal data for the purpose of such advertising. This also applies to profiling insofar as it is connected with such direct advertising. If the person concerned objects to the Deutsches Institut für Compliance e.V. processing for direct advertising purposes, the Deutsches Institut für Compliance e.V. will no longer process the personal data for these purposes. In addition, the data subject has the right to object to the processing of personal data concerning him/her which is carried out at the Deutsches Institut für Compliance e.V. for scientific or historical research purposes or for statistical purposes pursuant to Art. 89 para. 1 DS-GVO for reasons arising from his or her particular situation, unless such processing is necessary to fulfil a task in the public interest. To exercise the right of objection, the person concerned can contact the data protection officer of the Deutsches Institut für Compliance e.V. or another employee directly. The data subject shall also be free to exercise his right of opposition in relation to the use of information society services by means of automated procedures using technical specifications, notwithstanding Directive 2002/58/EC. If the decision (1) is necessary for the conclusion or fulfilment of a contract between the data subject and the data controller or (2) is made with the express consent of the data subject, the Deutsches Institut für Compliance e.V. takes appropriate measures to protect the rights and freedoms as well as the legitimate interests of the data subject, including at least the right to obtain the intervention of a data controller, to state his own position and to contest the decision. The controller has integrated components of LinkedIn Corporation on this website. LinkedIn is an Internet-based social network that enables users to connect to existing business contacts and make new business contacts. More than 400 million registered users in more than 200 countries use LinkedIn. This makes LinkedIn currently the largest platform for business contacts and one of the most visited websites in the world. Each time our website is accessed and equipped with a LinkedIn component (LinkedIn plug-in), this component causes the browser used by the person concerned to download a corresponding representation of the LinkedIn component. Further information on the LinkedIn plug-ins can be found at https://developer.linkedin.com/plugins In the course of this technical procedure, LinkedIn is informed which specific subpage of our website is visited by the person concerned. If the person concerned is simultaneously logged in to LinkedIn, every time the person concerned visits our website and for the entire duration of the respective stay on our website, LinkedIn recognizes which specific subpage of our website the person concerned visits. This information is collected by the LinkedIn component and assigned by LinkedIn to the respective LinkedIn account of the person concerned. If the person concerned clicks a LinkedIn button integrated on our website, LinkedIn assigns this information to the personal LinkedIn user account of the person concerned and stores this personal data. LinkedIn receives information via the LinkedIn component that the person concerned has visited our website whenever the person concerned is logged in to LinkedIn at the same time as accessing our website; this happens regardless of whether the person concerned clicks on the LinkedIn component or not. If such a transmission of this information to LinkedIn is not desired by the person concerned, he can prevent the transmission by logging out of his LinkedIn account before calling up our website. The controller has integrated components from Xing on this website. Xing is an Internet-based social network that enables users to connect to existing business contacts and make new business contacts. Individual users can create a personal profile of themselves at Xing. For example, companies can create company profiles or publish job offers on Xing. Each time one of the individual pages of this website is called up, which is operated by the controller and on which a Xing component (Xing plug-in) has been integrated, the Internet browser on the information technology system of the person concerned is automatically prompted by the respective Xing component to download a representation of the corresponding Xing component from Xing. More information about the Xing plug-ins can be found at https://dev.xing.com/plugins As part of this technical process, Xing is informed about which specific subpage of our website is visited by the person concerned. If the person concerned is logged in to Xing at the same time, Xing recognizes with every visit to our website by the person concerned and for the entire duration of the respective stay on our website which specific subpage of our website the person concerned visits. This information is collected by the Xing component and assigned to the respective Xing account of the person concerned by Xing. If the person concerned presses one of the Xing buttons integrated on our website, for example the „Share“ button, Xing assigns this information to the personal Xing user account of the person concerned and stores this personal data. Xing receives information via the Xing component that the person concerned has visited our website whenever the person concerned is logged in to Xing at the same time as accessing our website; this happens regardless of whether the person concerned clicks on the Xing component or not. If such a transmission of this information to Xing is not desired by the person concerned, he can prevent the transmission by logging out of his Xing account before calling up our website. The data protection regulations published by Xing, which can be accessed at https://www.xing.com/privacy, provide information on the collection, processing and use of personal data by Xing. Xing has also published privacy notices for the XING share button at https://www.xing.com/app/share?op=data_protection. Art. 6 I lit. a DS-GMO serves our company as a legal basis for processing operations for which we obtain consent for a specific processing purpose. If the processing of personal data is necessary for the performance of a contract to which the data subject is a party, as is the case for example with processing operations necessary for the delivery of goods or the provision of other services or consideration, the processing is based on Art. 6 I lit. b DS-GMO. The same applies to such processing processes that are necessary to carry out pre-contractual measures, for example in cases of enquiries about our products or services. If our company is subject to a legal obligation which requires the processing of personal data, for example to fulfil tax obligations, the processing is based on Art. 6 I lit. c DS-GMO. In rare cases, the processing of personal data may become necessary to protect the vital interests of the data subject or another natural person. This would be the case, for example, if a visitor were injured in our company and his name, age, health insurance data or other vital information had to be passed on to a doctor, a hospital or other third parties. The processing would then be based on Art. 6 I lit. d DS-GMO. Ultimately, processing operations could be based on Art. 6 I lit. f DS-GMO. Processing operations which are not covered by any of the aforementioned legal bases are based on this legal basis if processing is necessary to safeguard a legitimate interest of our company or a third party, provided that the interests, fundamental rights and freedoms of the data subject do not prevail. Such processing procedures are permitted to us in particular because they have been specifically mentioned by the European legislator. In this respect, it took the view that a legitimate interest could be assumed if the person concerned is a customer of the person responsible (recital 47, second sentence, DS-GMO). If the processing of personal data is based on Article 6 I lit. f DS-GMO, it is in our legitimate interest to conduct our business for the well-being of all our employees and our shareholders. This data protection declaration was generated by the data protection declaration generator of the German Association for Data Protection, the sample data protection declaration, which, in cooperation with RC GmbH, recycles used mobile phones and creates the warning specialists of the law firm of WILDE BEUGER SOLMECKE | Rechtsanwälte.